Hi guys! 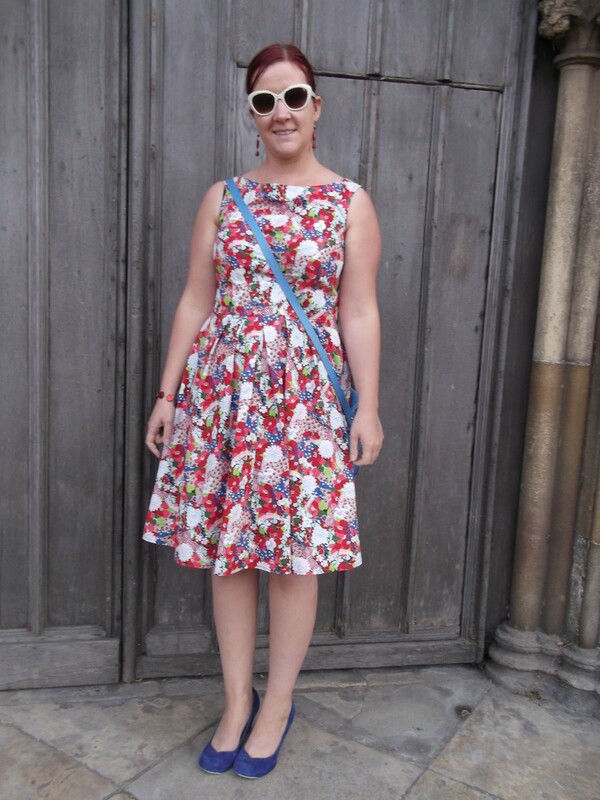 I’m kicking off ‘Red October‘ early with a second version of Simplicity 2444. After I had worked hard perfecting the fit for the first one, it seemed like a waste to only use the pattern once. Plus, I really wanted a quick project to sew for myself in between a lot of sewing for other people. 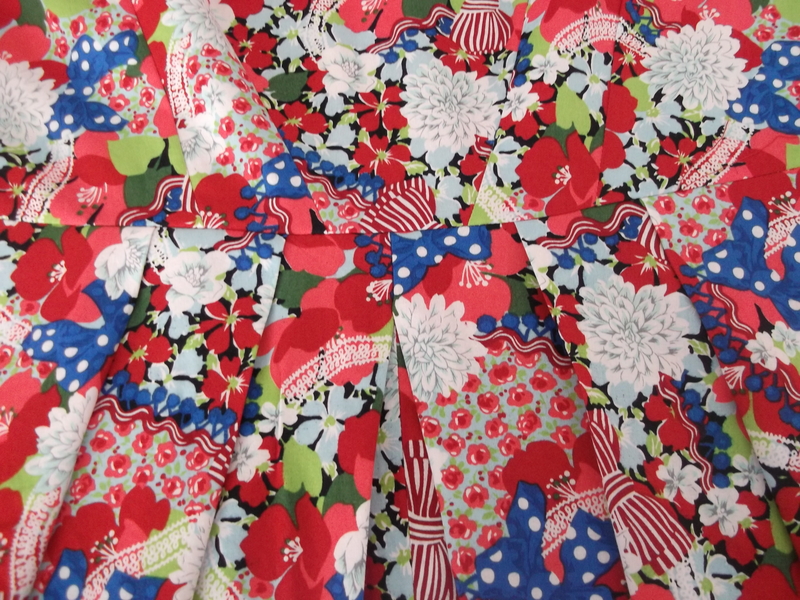 I bought this fabric at the Goldhawk Road meet-up in summer. Red is my favourite colour, but weirdly I tend to sew with greens and blues most of all, so I always keep an eye out for pretty red fabrics. At first I thought this fabric was crazy. It’s basically a fabric that would not look out of place on a pair of Irregular Choice shoes. The design is what I would describe as overkill – there’s flowers, ric-rac, polka dot bows, lace trim, bobble trim….lime green, red, coral, royal blue, white, mint green. It’s pretty mental. But, viewed from a distance, it actually looks a lot less mad! 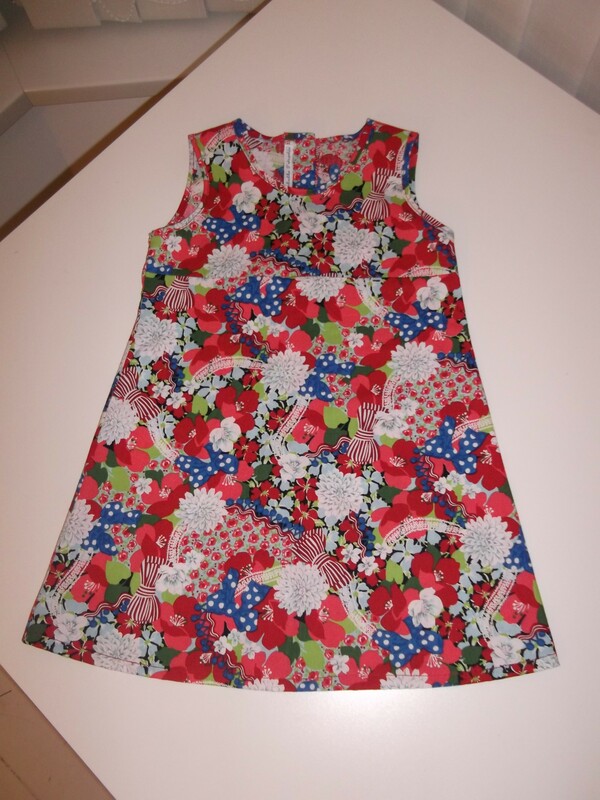 I also squeezed an age 18 month baby dress out of this fabric too, for a friend’s daughter. 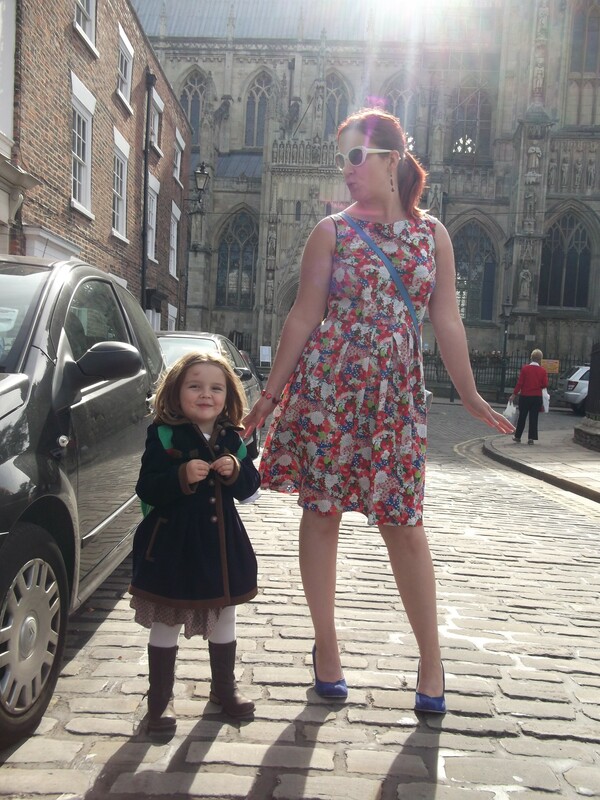 I used my favourite baby dress pattern for that – Burda 9750 – you can see plenty of my other versions of this dress here. There’s not much to say about the construction of my Simplicity 2444 that I didn’t say the first time. I did a lapped zip last time but a centred one this time, just because I felt like it and I don’t have a particular preference. The one negative thing is that this version is a teeny bit loose, because I’ve lost a tiny bit of weight recently (actually I don’t own scales, so I’m just guessing I’ve lost weight, according to the way my clothes are fitting me). It isn’t unwearably loose, of course (as you can see): it’s just I could comfortably lose an inch at the waistline. My bust seems to be sticking at FF/G cup (depending on the bra); I seem to have lost the weight on my waist and hips, which I guess is a good thing! 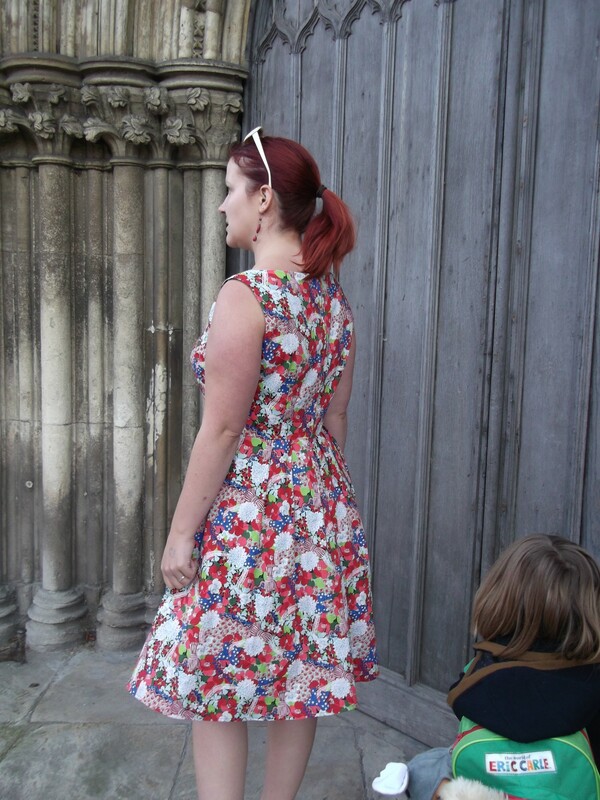 IF I continue to lose weight, then I’d have to redraft my modified pattern pieces to make this dress again! Side/Back view. With added child. 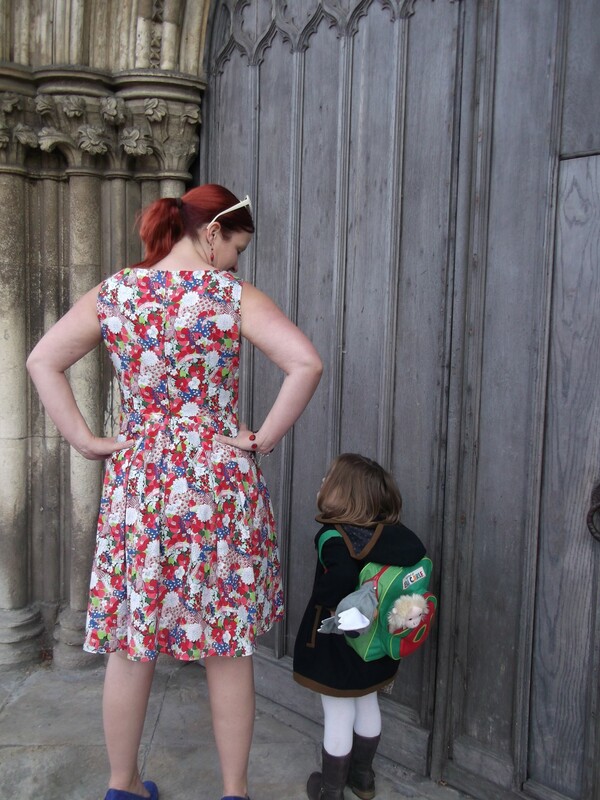 Anyway… the photos were taken by the beautiful Beverley Minster. 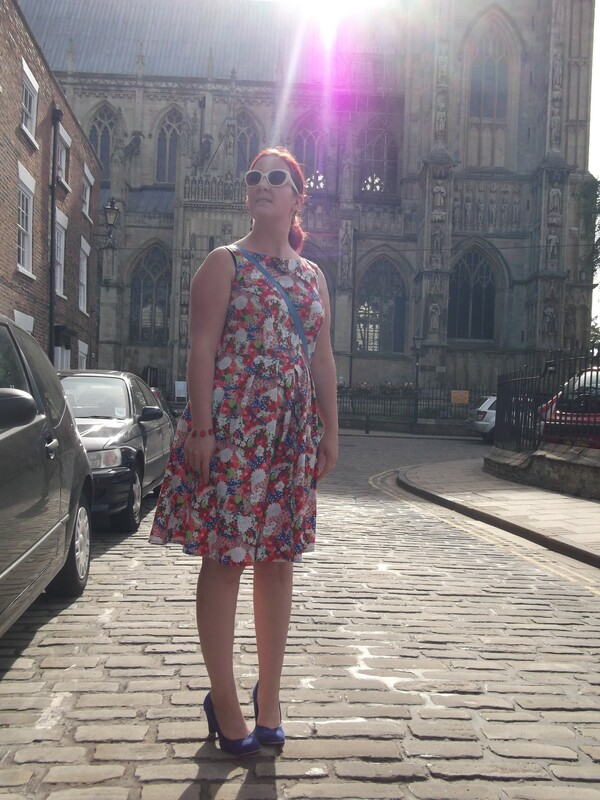 It was hard to get any really picturesque ones because the Minster is surrounded by buildings and the public are not allowed access to the gardens, which is a shame because there’s a fantastic plum tree there! Hands on hips back view. With added child. Again. Ooh. My skirt does this when the wind blows! The ‘strike a pose’ shot. And my photo-bombing daughter is back! By the way, ‘Red Octurber’ is the way in which people with a typical Hull accent would say ‘Red October’. The ‘o’ is often pronounced ‘errrrr’ – making ‘toast’ sound like ‘turst’, ‘load’ sound like ‘lerd’, and ‘notes’ sound like ‘nerts’. I have more projects lined up for Red October, it’s just a matter of finding the time! Thank you Liza Jane. I’m glad I went ahead and embraced the crazy! Thank you. It is an endearing accent, I must say! Those photos made me laugh with your beautiful, photo-bombing daughter! 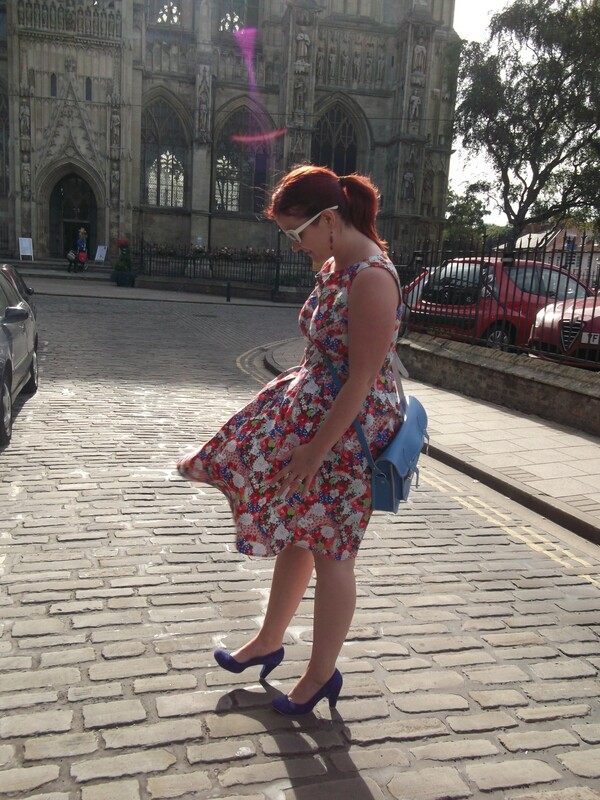 The dress is lovely but your shoes are great! Thank you! They are Irregular Choice shoes. Great fabric combined with a great pattern! Thanks. The pattern is great! This is super cute- what a rad fabric and pattern match! Thank you Amanda! I’m pleased it turned out nicely. I was in two minds whether to even use the fabric because it’s such a busy print, but I’m glad I did! This dress is just perfection in dress form! The fabric is completely mental but looks great as well. And the little photo bomb is such a cutie! Thanks Vicki Kate! My daughter is so used to having photos taken of her that she can’t understand it when we want to take photos without her in them! Wow! What a great dress! 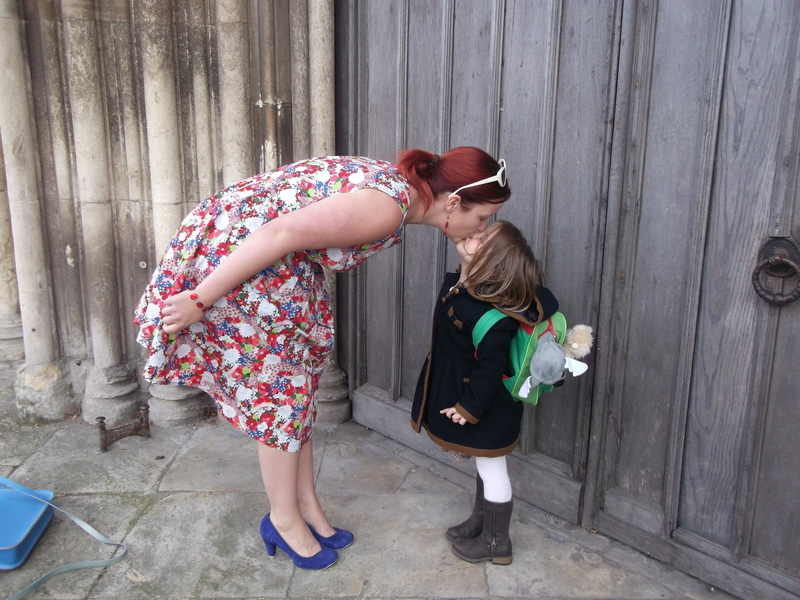 Any fabric that looks like it would make a fantastic pair of Irregular Choice shoes naturally will make an amazing dress 🙂 Your wee miss is adorable!! Haha, thank you! The shoes are Irregular Choice too, but quite plain compared with some of the really crazy ones! The fabric isn’t crazy at all, the dress looks fab, really suits you. I’d have never thought you’re ff/g by the way. And the photo-bombing daughter is very cute! That is awfully cute! Great job, girl! Fabulous dress! I absolutely love that fabric. And your daughter is adorable. 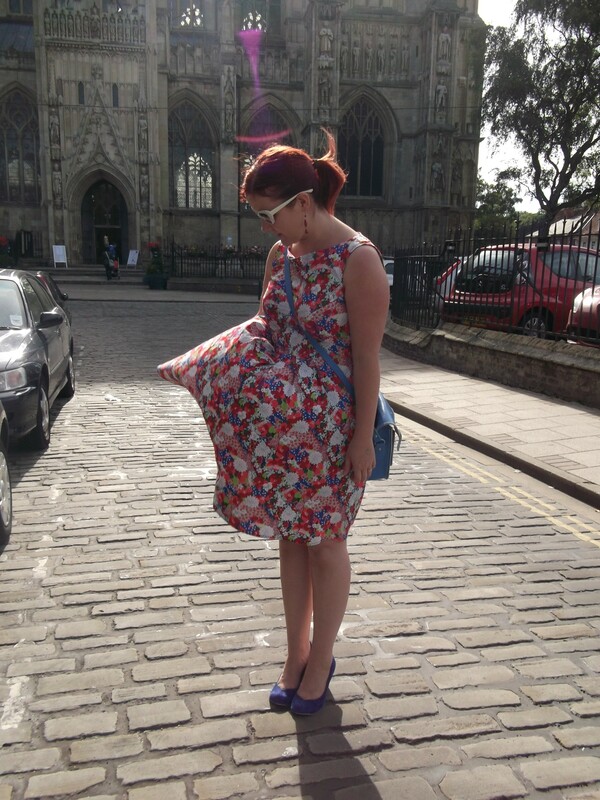 love mental fabric like this, and the dress is beautiful! Thank you. I’m glad I used the fabric!